The villain Jacques has stolen the Treasures of the Ages so he can harness their mystical powers in his evil plan to rule the world. 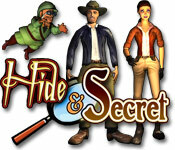 You must help Will Scout and Anna Lyze on their quest to defeat Jacques and rescue the treasures. Only by following clues and escaping Jacques’ sinister traps will you find his secret hidden base where he has taken the treasures so he can steal their power. Travel to 30 locations across the globe in your quest to rescue the Treasures of the Ages and defeat Jacques and his henchman Toadie.